I do have a confession of sorts to make, for some reason the history of Sparta just never grabbed me like some other parts of Greek history. Oh, I knew the perfunctory facts about Spartan life, but besides its role in the Persian, Peloponnesian and Theban wars, I never really read more of its history than that. I remember reading about Agis and Kleomenes (the book uses a K instead of the usual Cleomenes), but they weren't the parts of Plutarch that I read over and over again. By the eras of the Diadochi and the first Epigoni, Sparta had ceased to be a major player in Greece. So in the histories of that period it is hardly mentioned. After its humbling by Antipater, it seems to just disappear. 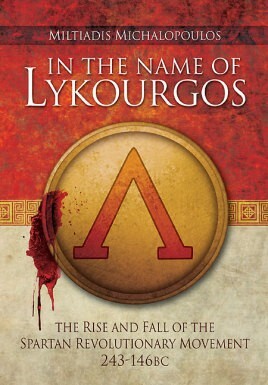 'In the name of Lykourgos' (Lykourgos is in essence the Spartan Solon), is an award winning book that brings to life the years 243-146 B.C. The book starts with the history of Sparta from its beginning to its preeminent place in Greece, and then its fall engendered by Thebes and Epamonidas. The real meat of the book begins with the ascent of Agis to one of the thrones in Sparta (there were two), and his attempt to bring Sparta back to its glory. The author shows here the differences between Agis's idea of what Sparta was in its glory years compared to the actuality. His short life and even shorter campaign to reverse time is eye opening for several reasons. The book also goes into the different ideas and reasons behind Agis's thoughts and those of his followers, who may have had other reasons to back him other than just admiring his plan. Like the Gracchi and other reformers, Agis and his companions were more than willing to cut corners or even completely go against the political system in place to force through his policies. The ideas in their heads and whether they were being pragmatic or were just misled about how the 'good old days' were, only they can tell us. With Agis's death it looked like the reform movement was killed in its cradle; that is until Kleomenes gains the throne. Strangely, Kleomenes father, in his role as co-king, was one of the most bitter enemies toward Agis and his reforming plans. So it is somewhat ironic that when Kleomenes comes to the throne he becomes the institutor of almost all of Agis's planned reforms. This is another historical tale of the lone warrior fighting against the changing times. The days of the city state controlling Greece's future were over. Still, Kleomenes came within an ace of bringing Sparta back to being a player on the world stage. Greece was now a pawn to be played with by the Macedonian kings, and the two leagues of cities: Aetolian and Achaean. Even this age was short lived with the shadow of Rome looming from the west. The author continues with the story of Sparta down to the Roman conquest of Greece.